It has been a while since the Cracker Barrel has made a new addition to their side dishes, Cracker Barrel Cucumbers Tomatoes and Onions is one of their new side dishes. This is a great light side dish that is so easy to make. 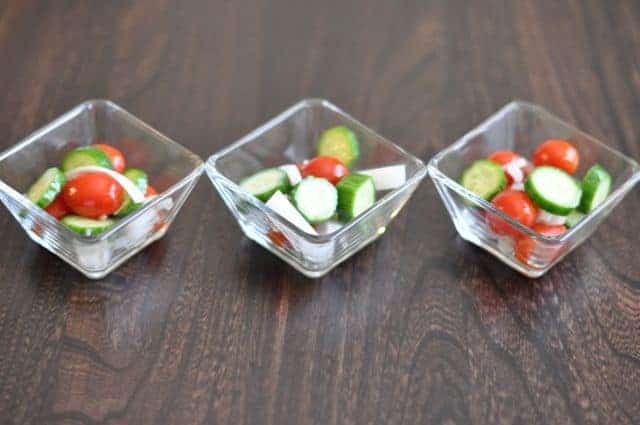 This side salad is packed full of fresh cucumbers, grape tomatoes, and white onions. One thing that I love about the Cracker Barrel is its homey style menu. Every time I go there I feel like I am stepping into my Grandmother’s house. She would always make cucumbers and onions every summer with the cucumbers from their garden. This recipe from the cracker barrel adds those lovely sweet grape tomatoes in this well-known salad. This salad is perfect for those of us who like to cook ahead. This salad will stay nice and fresh in your refrigerator for about a week. In fact, the flavor only improves as the flavors mingle. So be sure to put this one together ahead of time. You may want to season this with a little fresh cracked black pepper. While they don’t add cracked pepper at the Cracker Barrel I think this adds a very nice touch to this recipe. You can make Cracker Barrel Cucumbers Tomatoes and Onions just like they do at home. Slice cumbers into thin 1/4 inch slices. In a bowl mix together vinegar, sugar, and Italian dressing. Add sliced cucumbers, tomatoes, and slide onions. Cover and allow the vegetable to marinate for about an hour before serving. Apparently I am late trying this recipe!! We loved it! I plan to make it often!! So easy to make! I had everything in the fridge to make this salad. You have no vegetarian or vegan rec. I don’t have a section for vegetarian recipes, some are vegetarian naturally though. Why no garlic and/or celery? When I tried the recipe neither was in the salad. The original has celery seed in the marinade… Certain of it. I didn’t notice that when I tried the dish. They may have modified the recipe since I have tried it. I will have to go back and check out the dish again. Don’t be such a mean person. Good, but too sweet for my taste, so I added salt and pepper to improve. Next time, only 1/4 c sugar. Right proportion of tomatoes to cukes to onions. Almost as good as cracker barrel! Super yummy. Why the video? When activated it posts a sign saying “This video is private” and will not play.